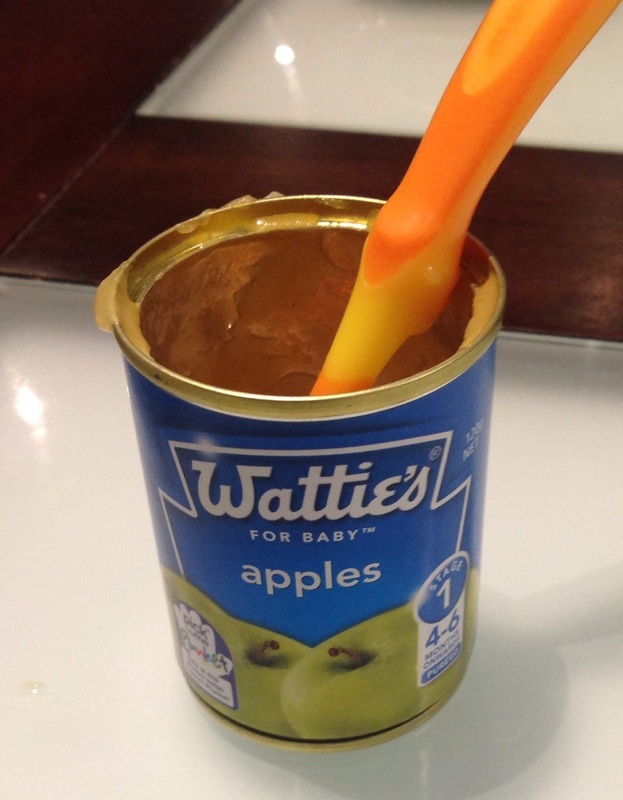 I had reservations writing about Watties for babies' puréed apple. Although easily the most popular of Watties stage one foods, how much could actually be written about a can which is not only sourced from a single ingredient, but one that is so prevalent in our own daily diet? 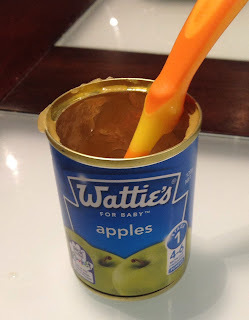 Then idealised that I didn't really have a choice: Watties Apple may be the Toyota Corolla of the baby food world, as compared to the Audi A4 that is Only Organic Pear, Purple carrot, Blueberry and Quinoa, but just because every New Zealander has driven a Corolla at some point, should its safety and drivability not be put up to the occasional scrutiny? Early Friday breakfast seemed an ideal time to try this offering. So as Mum slept, and big brother amused himself in a box, Emily and I sat down. What mathematical jiggery pokery is this Watties? You can't claim one ingredient constitutes 100% of the recipe! then go ahead and add a second ingredient? That's like giving 110% on the rugby field! it looks impressive, but in the end it's a load of self congratulatory BS! Unless you claim the vitamin C is present in the apple, in which case it's not really a separate ingredient, is it Watties? First impressions: As I scrutinised the famous blue tin, something leapt out: only green Granny Smith apples were pictured. Whilst high in antioxidants, this seemed an unusual choice in sole ingredient due to it's higher acidity, and resulting tartness in taste. Sure, the Granny Smith does mellow with age, but as it ripens will become more yellow in colour than those apples pictured. This all added to the mystery within. With such intrigue, however, the familiar thin yellow-brown paste felt quite reassuring. 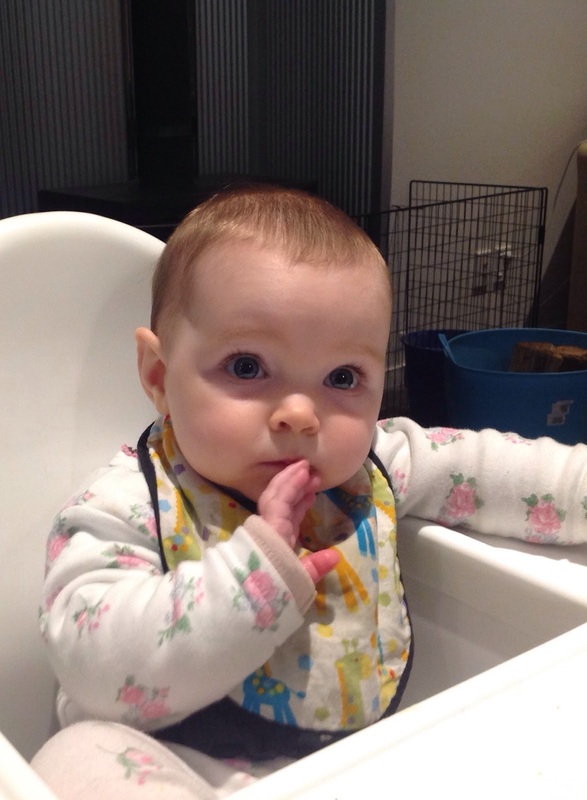 Emily's reaction: after a long night with only one feed three hours previously, Emily was ready for some breakfast action. Big brother was hooning around, and the dog provided plenty of additional distraction. As such, there were several pauses in the dining experience, but each was ended by a shrill demand for the shovelling to re-commence, and only by the time the bottom of the can was in sight was she truly satiated. Bouquet: not entirely unexpectedly, it smelt of apples: sweet, fragrant and enticing me in to the tasting. Taste test: A pleasant smooth, easy texture in the mouth, a relief after the granular texture of my last two tastings. The Granny Smith tartness does indeed come to the fore, but I feel I detect the sweetness of Braeburn, perhaps a Cox Orange. For authenticity, I compared to a Granny Smith in its raw state, and certainly the puréed form hinted at the addition of other varieties. The apples certainly taste as though skinned, so I imagine the fibre content in this product would be lacking. I think Watties could make improvements, possibly with the addition of a Pacific Rose or Pink Lady varietal, however given these are the pricier types of apple, I would probably expect this more in a premium range product. Overall: A highly commendable 9/10. 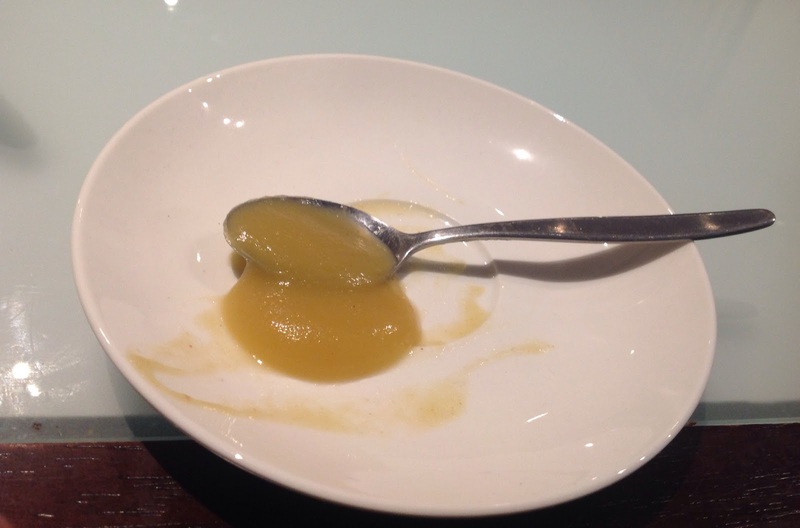 They say the proof is in the pudding, and in this case the pudding is a tin beautifully puréed apples. Delicious. Enjoy with: A spitroast pork, if you've managed to forget the apple sauce. I think it would also make a more than passable base for home brewed cider.